Kenneth C Norbury, PhD, Barbara A Collins, BS, Deepak V Kilpadi, PhD MBA. Kinetic Concepts, Inc.
Introduction: Treatment of penetrating abdominal trauma is often confounded by the inability to completely close the abdomen as a result of massive visceral edema. Temporary abdominal closures (TACs) have been increasingly utilized for the treatment of the open abdomen (OA), and negative pressure therapy (NPT) for such clinical conditions has shown promise in decreasing morbidity and/or mortality. This study evaluated the impact of NPT on porcine bowel anastomoses using burst strength as a measure. Burst strength can be defined as the intraluminal pressure (ILP) required to induce anastomotic failure/bursting. Burst strengths with and without negative pressures (NP) were compared to baseline ILP. 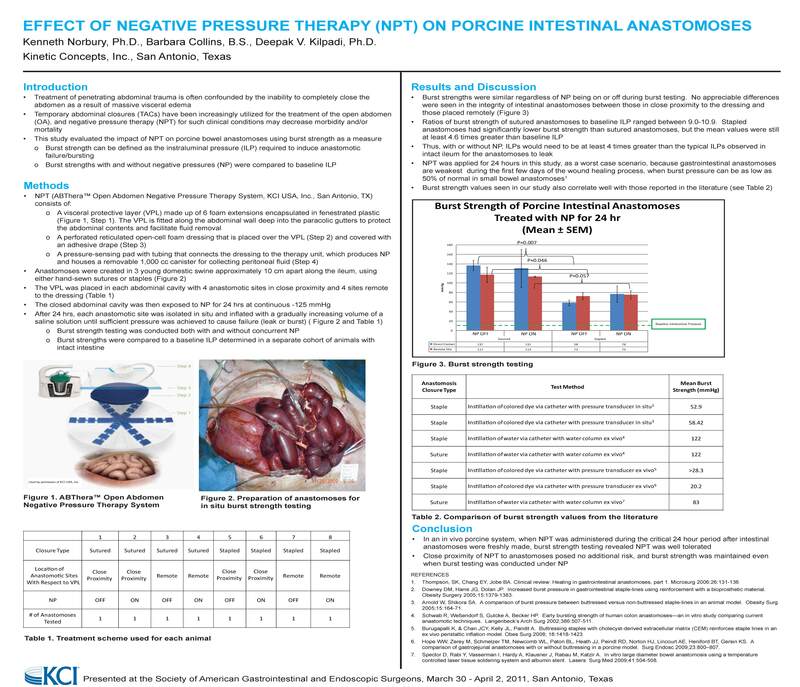 Methods: NPT (in this case, ABThera™ Open Abdomen Negative Pressure Therapy System, KCI USA, Inc., San Antonio, TX) consisted of polyurethane foam encased in a fenestrated visceral protective layer (VPL), extending into the paracolic gutters. Tubing connects the dressing to a therapy unit that produces NP, and houses a canister for collecting peritoneal fluid. Anastomoses were created in 3 young domestic swine approximately 10 cm apart along the ileum, using either handsewn sutures or staples. An NPT dressing was placed in each abdominal cavity with a representative number of both anastomosis types positioned either in direct contact with the VPL (near the surface of the abdomen) or deeper into the abdomen remote to NPT dressing placement. The closed abdominal cavity was then exposed for 24 hr to -125 mmHg continuously, after which each anastomotic site was isolated in situ and inflated with a gradually increasing volume of a saline solution until sufficient pressure was achieved to cause failure (leak or burst). Burst strength testing was conducted both with and without concurrent NP, and burst strengths were compared to a baseline ILP determined in a separate cohort of animals with intact intestine. Results and Discussion: Burst strengths were similar regardless of NP being on or off during burst testing. No appreciable differences were seen in the integrity of intestinal anastomoses between those in close proximity to the dressing and those remotely placed. In addition, the ratios of burst strength of sutured anastomoses to baseline ILP ranged between 9.0-10.9. Stapled anastomoses had significantly lower burst strength than sutured anastomoses, but the mean values were still at least 4.6 times greater than baseline ILP. Thus, with or without NP, ILPs would need to be at least 4 times greater than the typical ILPs observed in intact ileum for the anastomoses to leak. NPT was applied for 24 hours in this study, as a worst case scenario, because GI anastomoses are weakest during the first few days of the wound healing process, when burst pressure can be as low as 50% of normal in small bowel anastomoses. Conclusion: In an in vivo porcine system, when NPT was administered during the critical 24 hour period after intestinal anastomoses have been freshly made, burst strength testing revealed NPT was well tolerated. Close proximity of NPT with anastomoses posed no additional risk, and burst strength was maintained even when burst testing was conducted under NP.